Dongying Li, a University of Illinois doctoral student in landscape architecture, and William Sullivan, head of Illinois’ landscape architecture department, found that classrooms providing a view of green space significantly improve high school students’ performance. Their findings are being published in the journal Landscape and Urban Planning. CHAMPAIGN, Ill. — High school students perform better on tests if they are in a classroom with a view of a green landscape, rather than a windowless room or a room with a view of built space, according to research from the University of Illinois Department of Landscape Architecture. The research found that students with a green view outside a classroom window performed better on tests requiring focused attention and recovered better from stress. It is the first study to establish a causal relationship between exposure to a green view and students’ performance, said William Sullivan, head of the landscape architecture department. The findings are being published in the April 2016 issue of the journal Landscape and Urban Planning. The article is available now online. 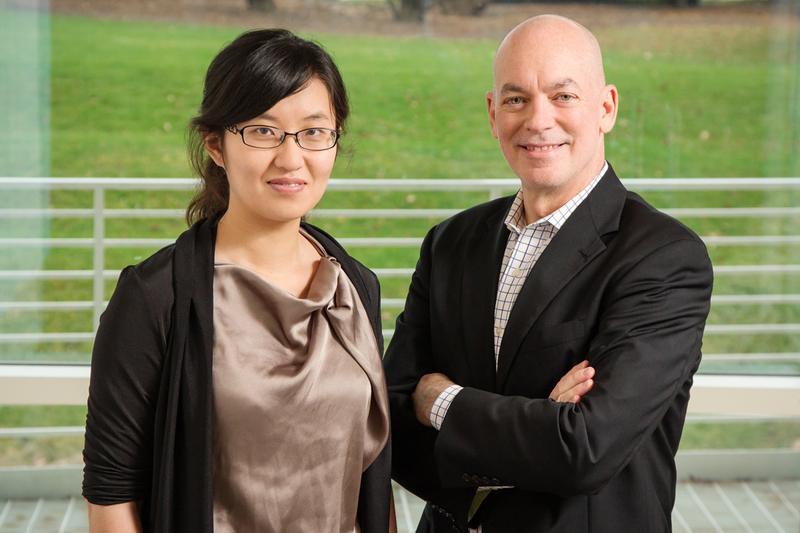 “It’s a significant finding, that if you have a green view outside your window, you’ll do better on tests,” said Dongying Li, a doctoral student who conducted the research with Sullivan. Students’ capacity to pay attention increased 13 percent if they had a green view outside their classroom window, the study found. Li said she and Sullivan hope the results of their research will lead to policy changes. Changes in school design and in policies regarding recess, for example, “would be a much better investment than any of the things we spend money on in secondary education today,” Sullivan said. The research involved 94 students at five central Illinois high schools. Students were randomly assigned to one of three types of classrooms – windowless, with a window looking out onto built space (such as another building façade or a parking lot), or with a window looking out onto green space. Each type of classroom had a similar size, layout and furniture. The students participated in one-on-one experiments in which they did 30 minutes of activities that included a proofreading exercise, a speech and a mental math exercise. Following the activities, the students were given an attention test, then a 10-minute break in the classroom and another attention test following the break. These tests asked students to repeat a series of numbers in the same and reverse order in which they heard the numbers. During the entire experiment, sensors took physiological measures of their stress levels by measuring their heart rate, skin temperature and skin moisture. The students were also asked to rate their mental fatigue and stress by filling out a questionnaire at different points during the experiment. The findings: Students did better on the attention tests given after the break if they were in a classroom with a green view, Li said. Those students showed a 13 percent increase in performance following the break. There was no statistical difference in performance for the students in the windowless room or the room with a view onto a built space. Similarly, the students in the room with the green view showed a greater physiological recovery from stress after the break than the other students. The researchers also wanted to know if the green view affected the students’ performance on the activities preceding the break. They found it did not have an impact on how they performed those activities or the attention test before the break, but there was a significant difference in how well they did on the attention tests following the break. They hypothesize the reason has to do with Attention Restoration Theory, Li said. When someone focuses on a task, he or she must ward off other distractions, either those in the environment or the thoughts inside their head, all competing for attention. Doing so causes fatigue, and after a while, a person feels mentally drained. When someone stops focusing, his or her attention is drawn involuntarily to certain things – a campfire, a waterfall, a baby, a puppy. Focusing on those things doesn’t require effort, and the theory suggests that doing so provides an opportunity for the brain to rest and restore its ability to focus attention again. In the case of the experiment, the students focus their attention on the activities they must perform. During the break, if they are in a room with a view of a green space, their attention is involuntarily drawn outside and the view restores their mental energy. “When they take their heads out of a book and release their attention, there is a measurable difference” in performance for the students who had the green views, but not for the students randomly assigned to the other kinds of classrooms, Sullivan said. Likewise, views of nature enhance recovery from stress, and the students with a view of a green landscape showed a greater recovery from stress. Li noted that earlier studies showed exposure to daylight increased students’ performances. However, those studies didn’t note what the view was from the classroom windows. The research she conducted with Sullivan shows that the view of a green landscape might be the factor influencing students’ performances. The researchers suggest their findings can help designers, planners and policymakers enhance students’ well-being and learning. For example, planners can identify sites for new schools that already have trees and other vegetation, or they can plant many trees on the site; architects can locate classroom, cafeteria and hallway windows so they look onto green spaces; and school schedules can allow short breaks to restore students’ attention and help them recover from stressful tasks. Editor’s notes: To reach Dongjing Li, email dli13@illinois.edu. To reach William Sullivan, email wcsulliv@illinois.edu. Their article “Impact of views to school landscapes on recovery from stress and mental fatigue” is available online.